What Are the Most Common Types of Auto Accidents in Fayetteville, Georgia? Auto accidents in Fayetteville are extremely prevalent, just as they are throughout the United States. In fact, they are one of the leading causes of deaths every year in the country. You can probably recall at least one or two auto accidents that you drove past in Fayetteville, Georgia this week if you think hard enough. That’s how common they are. With the different types of car accidents, the legal process can be convoluted, which is why you should consult an auto accident attorney in Fayetteville, Georgia if ever injured in a car accident. Read-end collisions are the ones you hear about most often and are typically the fault of a distract driver, tailgating, or slick road conditions. The reason these car accidents are so dangerous is the potential to sustain a whiplash injury. This type of injury is typically sustained by the impacted car and fault generally lands on the driver that rear-ends the other vehicle. Side-impact collisions are also known as T-bone accidents. These auto accidents typically occur in parking lots or intersections where vehicles cross paths. The severity of injuries in these vehicles varies depending on how hard and where the vehicle is struck. Head-on collisions often result when drivers drift into oncoming traffic, and the two front ends of the vehicles hit each other. This can occur when trying to pass someone or avoiding debris on the road. Anytime you swerve into a lane of traffic going the opposite way, you are at risk of a head-on car accident. Single car accidents are types of automobile crashes that only involve one vehicle. These can include run-off collisions, hitting an animal, running into fallen debris, and vehicle rollovers. These crashes can be complicated, which makes determining fault and collecting damages more difficult. 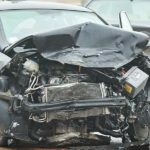 If you become injured in one of these types of car accidents, you should contact a Fayetteville, Georgia auto accident attorney right away. What are the biggest causes of auto accidents in Fayetteville, GA? While this list is not all-encompassing, you can clearly see that most accidents result from driver error. How many times while driving have you seen another driver using their phone, disobeying speed limits or driving aggressively? While accidents caused by inclement weather, design defects, and animals are often unavoidable, most car accidents are caused by driver neglect. This means you can collect damages that result from an auto accident. What should I do if I become injured in a car accident? If you are injured in a car accident in Fayetteville, Georgia, the first thing you should do is call the police. The police report will be important if you need to file a lawsuit against the other driver or their insurance company. After calling the police, you should try to collect what information you can. Get the other driver’s name, contact, and insurance information. You should also get the contact information of any witnesses that stuck around after the car accident. They may be required to testify on what they say if the case goes to trial. If possible, take photos of both cars, damage to personal property, and the surrounding area for your records. You should also seek medical attention immediately. If you are severely injured, an ambulance will be called to the scene, and you should get a report from the EMS. Even a slight injury should be examined because it can become more pronounced and painful over time. As soon as possible after a car accident, you should also contact an auto accident attorney in Fayetteville, Georgia to handle your case. The legal process after a car accident is long and complex. You deal with the at-fault driver, their insurance company, your insurance company, doctors, law enforcement and more. It is easy to become overwhelmed, which is why you should contact one of the auto accident attorneys in Fayetteville, Georgia at the Wade Law Office for a free consultation today. We will fight aggressively to protect your rights and help you move on after an automobile accident.